Whilst we all read with amazement that well over 1,500 of the world’s best Masters Age Category sprinters would compete in Malaga, there was one M45 sprinter who was very pleased to be able to be here at all; whose story is so inspirational and who has shown supreme courage to fight back from a life threatening disease to which he lost one of his lungs, and prepare himself to world record-breaking fitness, all within such a short space of time. He is 48-year old Jason Carty from Great Britain & N. Ireland. He was drawn in Heat 10 of the M45 100m on 5 September, winning in 11.44sec; the fastest qualifier. Early the next morning he had his semi, winning in 11.14 (+1.3) again the fastest from the three semis. At 20.00 the same day he went on to take the World title in 11.01sec, (+0.3) a new British M45 record from Hiroaki Akabori, Japan 11.33sec and Takeshi Fukuzato Japan, 11.35sec. On 7 September, Day 3 of the Championships, he lined up with 91 other 200m sprinters, winning his Heat, and going on to take the semi on 9th in 23.36sec and the Final later that day for his second World Masters Athletics gold medal in 22.91sec. What is so amazing about this sprinter is that he has achieved all this in searing heat (33/29°) and oppressive humidity less than two years after sacrificing a lung to cancer. 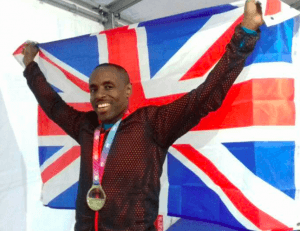 The 48-year old has an impressive background, he has now broken the British M45 100m twice, won the British Masters title and moved down an Age Category to run in an M40 4 x 100m relay that set a World Record time of 42.18sec (yet to be ratified) in August. He took the European Indoor 60m gold in Madrid in a National record 7.12sec and led the 4 x 200m relay to a silver medal. As an M40 he won the WMA Indoor 60m silver medal in Jyvaskyla in 2012 and two silver medals in Lyon in 2015 as well as European Indoor and relay medals. He is very likely to be a member of the British M45 4 x 100 team on Sunday, should they not get in the first three, Jason deserves a medal for his courage and inspiration.